CHOOSE JAMES HARDIE® SIDING - AMERICA’S FASTEST GROWING SIDING - FOR YOUR HOUSTON HOME. Live Oak is a certified James Hardie remodeler, a distinction that means you’ll be getting the best siding product available from the most qualified Houston siding contractor. James Hardie’s innovative siding products will increase the beauty, value, safety and durability of your Houston area home. You’ll enjoy the low maintenance that comes with baked-in color, and feel safe knowing that James Hardie siding products are resistant to just about anything the weather can throw at them. With the HardieZoneTM System, James Hardie provides siding with specific performance attributes relative to the climate where the product is being used. James Hardie now gives you the optimum siding for your home and climate here in Houston’s unpredictable weather conditions. 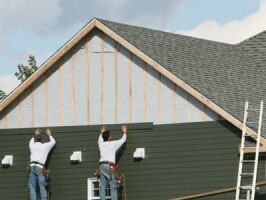 Call us at (877) 207-8343 or click to schedule a FREE siding estimate. Let us help you make your vision for your home come true!